is a picturesque fishing village in Portugal with amazing atmosphere, where is still to be seen women wearing traditional costumes with seven flannel skirts in different colors. 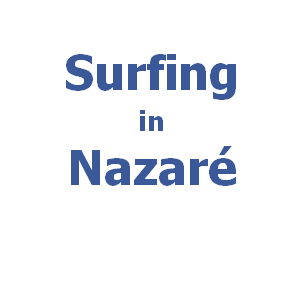 Nazaré became famous in the world of surf thanks to its giant XXL size waves. Specially after the surf record from 2011 this place is in the middle of attention between all big surf lovers. The year 2011 in November, a Hawaiian surfer Garret McNamara surfed a giant wave of 23,4 m (from trough to crest). Since that, Garret McNamara and other big wave riders are present in Nazaré every year when the big winter swells come. These impressively giant waves form in Nazaré, because of the underwater “Nazaré Canyon”. The Nazaré Canyon has up to 5 km depth and is about 230 km long. Thus, it causes very high breaking waves which are amazing for big wave surfing. The best known surf spot in Nazaré is Praia do Norte with the biggest waves in Portugal. This surfing is for really expert surfers. Waves at Praia do Norte are big, heavy and powerful. Even you are not able to surf it, it is worthy to come to Nazaré and see the performance of big wave riders. The best conditions at Praia da Norte are with the wind blowing from east and west or northwest swell. It is a beach break working at low tide. Another surf spot is Praia da Vila, which is next to the central promenade of Nazaré. It is also called Praia da Nazaré. There is a beach break with right and left waves and sandy bottom. But Praia da Vila is for experienced surfers, because the waves are fast, heavy and powerful. This is a favorite place for tourists in Nazaré. There are many restaurants and cafés along the beach. The waves at Praia da Vila are not very consistent. It works with east, northeast or southeast winds and west or northwest swells. Praia da Vila works better with bigger swells. On the south part of Nazaré is Praia do Sul beach. It is next to the Nazaré harbour. It has also an alternative name Indonaza. Praia do Sul is working with big swells, which create tubular and fast waves with power. These heavy waves of Nazaré require good surfing level. Praia do Sul is not very consistent surf spot. It works the best with southeast or east wind and west or northwest swell. Surf it at Praia do Sul during low tide.